The Ford Taurus is a vehicle that attracts attention wherever it goes. This vehicle has a sophisticated and refined look on the inside and outside. An aerodynamic shape gives the vehicle a unique look when looking at it from the outside. On the inside, this vehicle is rich in details. The exterior styling of the Ford Taurus gives it a powerful statement. The LED signature lighting is a feature that will definitely stand out to other drivers on the road. Aside from this, the bold grille complements perfectly with the front end of the vehicle. The interior styling of the vehicle is soft to the touch and is made with high quality materials. The Taurus features insulation in the engine compartment to reduce engine and external noise so that you and your passengers can have the most pleasant ride experience possible. 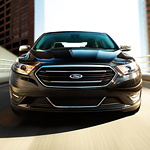 You can be certain to find excellent styling and craftsmanship in the Ford Taurus.